Happy Halloween, blog fans! It seems a bit odd to be bringing you a winter/holiday collection today, but that's what we're going to chat up. 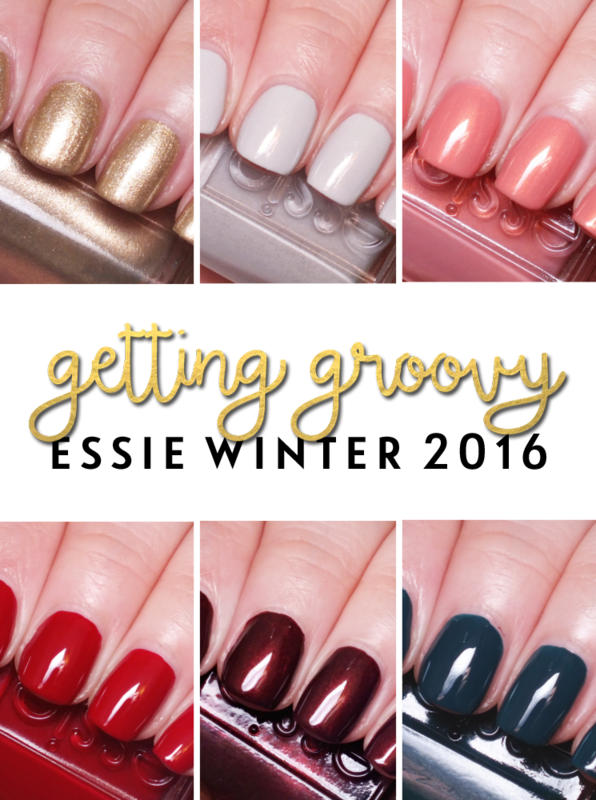 Essie is Getting Groovy this season, with a collection inspired by the grooving, London sixties scene. 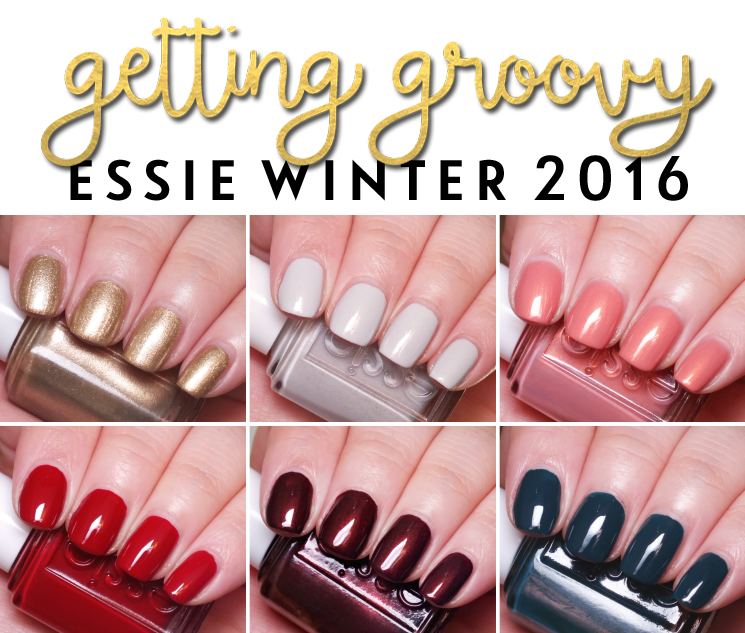 The six piece collection features some fun shades- both standard and unique- to see you through this winter. Read on for a closer look? "Catch a double-decker bus to swinging sixties London. Slip on your tallest heels because this party on a platform is ready to boa. Relax and go with the flowy as you and your satin sister make the scene at the coolest clubs. What do you think about getting groovy, baby? Oh behave!" Getting Groovy is a pretty amazing molten metal shade. It's gold overall, but has a silvery tone and softness to it. Formula is amazing, as it's smooth, no brush strokes and is almost a one coater. Two coats. Go With the Flowy is a soft, dove grey with subtle shimmer. I love all forms of grey, and this shade is no exception. An easy formula, two coats. Oh Behave! 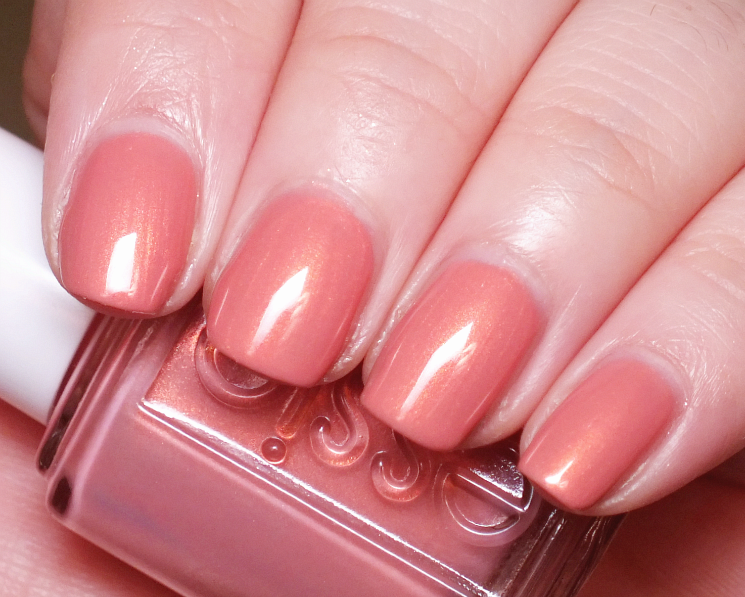 is a peachy-pink with a glowy, iridescent golden shimmer. Super pretty and feminine. The formula is a bit thin and sheer on the first coat, but builds very well. Two coats. 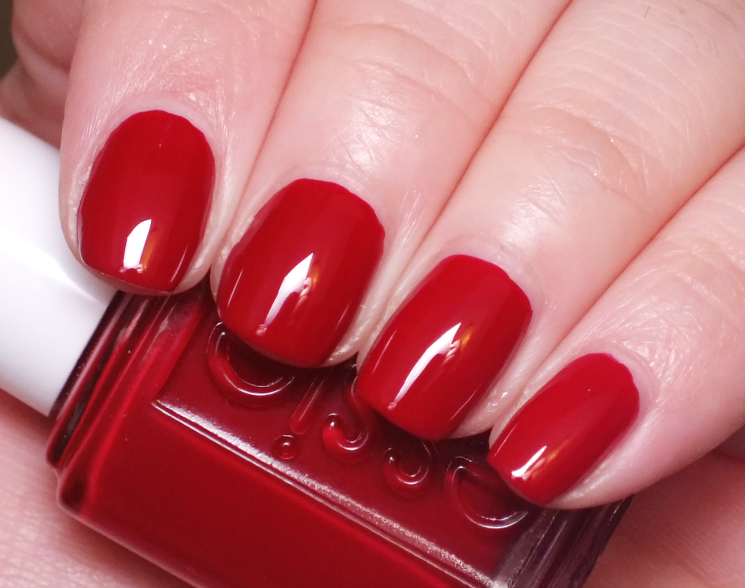 Party on a Platform is a what Essie calls a 'London garnet red' but it's really just a medium depth red. It's nice, but pretty standard. The formula is great though, so should you need a red this is a great option. Two coats. Ready to Boa is a stunning deep, red based brown with a bronze-y glow. It's the type of shade you can get lost in... Plus, it's a one coater! What you see is ONE coat. The formula is on the thicker side, be still easily managed. Satin Sister is a deep, hunter-type teal. It's a stunning shade, no doubt, but I do feel like we've seen similar from Essie in past collections. It has a thicker formula (much the same as Ready to Boa) and as such is another one coater. Overall, this is a pretty solid winter collection. I am really into Getting Groovy, Go With the Flowy, and Ready to Boa, but you can't miss with any of the formulas. What do you think? Are you loving any of these shades? What are you wearing on your nails?